The Compulsive Reader: Looking Ahead: Cat Hellisen and When the Sea is Rising Red! Looking Ahead: Cat Hellisen and When the Sea is Rising Red! 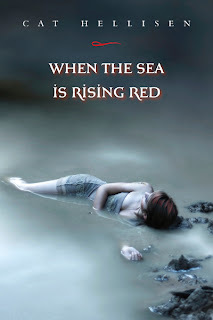 Today I have Cat Hellisen here to talk about her new book, When the Sea is Rising Red! Isn't that an awesome title? TCR: What has surprised you the most so far about the publication process? CH: The cool stuff. I knew it was going to be neat to see a cover and get blurbs and watch the book take shape, but I never realised how utterly awesome it is to watch your simple little text document transmogrify into a real book and have people read it. TCR: What was your reaction when you saw your cover for the first time? CH: I had such a different image of what I wanted (I'm a sucker for really simplistic, graphic-designy covers) that at first I was totally unsure of it. It didn't take long for the darkness and creepiness to win me over. I've noticed recently it's getting a lot of buzz so it's a good thing this author is not a designer. It's a great cover. "In sixteen-year-old Felicita’s world, magic is strictly controlled—or so those in power like to believe. After her dearest friend, Ilven, kills herself to escape an arranged marriage, Felicita chooses freedom over privilege. She fakes her own death and leaves her sheltered life as one of Pelimburg’s magical elite behind. Living in the slums, scrubbing dishes for a living, she falls for charismatic Dash while also becoming fascinated with vampire Jannik. Then something shocking washes up on the beach: Ilven’s death has called out of the sea a dangerous, wild magic. Felicita must decide whether her loyalties lie with the family she abandoned . . . or with those who would twist this dark power to destroy Pelimburg’s caste system, and the whole city along with it." Sounds awesome, right? And that cover is to die for! I can't wait for this one to come out! What do you think? This book sounds good and that cover is just gorgeous yet original.